Addemar Support Knowledge - When I create content, how do I work in the editor? You can choose to work in the WYSIWYG editor (What You See Is What You Get), this is like working in Microsoft Word or Microsoft Frontpage; or you can work in HTML. The editor opens up when you click a text area in the interactive preview. This dialog is used to create the content of your e-mail or landing page. You can insert text, layout the text, and insert links, tables and images. Note: Independently from how you created your e-mail, it will be sent in HTML format. While you are working in the WYSIWYG editor, you are creating html code in the background. 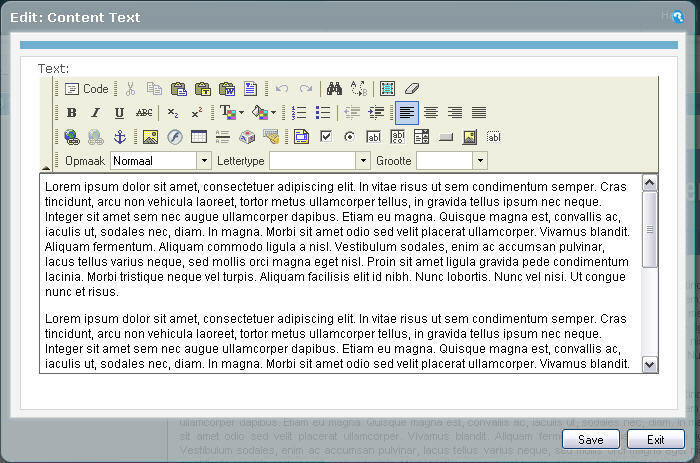 In this text area, you can work as in any HTML editor. You can also copy-paste HTML code created in another program. You can always switch to the WISIWYG editor by clicking the button again. Click Save to save changes. Your e-mail or landing page is immediately shown in the interactive preview. Cut or remove the highlighted text. Paste the text you copied. You can also copy from another application and paste here. Paste the text you copied without formatting (as plain text). To copy text from Microsoft Word: Click this icon. A special dialog appears. Copy text from Microsoft Word, and paste it into the area on the dialog. Erase font definitions, check the first checkbox. To erase style definitions such as text colour, check the second checkbox. Click OK to paste the text into the WYSIWYG editor. All unnecessary code from Microsoft Word is erased. Note: we advise to check both checkboxes before clicking OK.
To insert some ready-made elements in the content of your creation. This function includes a standard form, a send to friend link and two different send to friend forms. Place your cursor where you want the form to appear. Make sure the check box Replace actual content is not checked (unless you want to replace all the content of this area). Click the element you want to insert. Undo or redo the most recent action taken. Find a word or phrase within the text of the page. You can indicate whether you want to respect upper/lowercase or not. Select all of the text in the page (usually used before copy or cut or to apply a style or format to the whole page). Make the hightlighted textBold, italic, underlinedor strikethrough. Make the hightlighted text superscript or subscript. Adapt the alignment of the highlighted text (left, centered, right, justified). Add or remove a hyperlink from highlighted text. Select the text where you want to put the link. Choose URL and type the url in the URL field. Click the Doel or Target tab. In the first drop down, choose new window (_blank). For the receiver of your e-mail, this link will open in a new browser window. First define the anchor. Select the text where you want the link to arrive. Give a simple name to the anchor and click OK. You have defined an internal anchor now. Select the text where you want to put the link to this anchor. Choose internal link in the page and select the anchor from the list of anchors. Click OK to create the anchor link. Select the text where you want to put the link (most of the time this will be an e-mail address or a name). Choose E-mail and type at least the e-mail address. You can also predefine an e-mail subject and a standard message, but this is not mandatory. Click OK to create the mailto link. Select the text where you want to put the link to the landing page. Choose Landing page and select the landing page you want to link to in the drop down list that appears. Click OK to create the landing page link. Note: A landing page link cannot be tested in the Preview. Send a testmail to test out your landing page link. A file link is a good alternative to an attachment in an e-mail. Attachments are easily caught in SPAM filters. File links are links to files that physically reside on a server and can be opened or downloaded from that server by the receiver of the e-mail. Click the button Bladeren op server/Browse on server. Browse to the file you want to link and click it. Click OK to create the file link. To edit an existing link, right-click the link. A pop-up with a menu appears. Choose the option Edit link. You can change the link properties now. Select the link you want to remove. Put your mouse cursor where you want to insert the image. Click the button Bladeren op server/Browse on server. You will be able to browse your library. Browse to the image you want to insert and click it. In the Alternative field, fill in a short text describing the image. This text appears if for one reason or another the image would not appear when your e-mail or landing page is viewed. In the Width and the Height field, the dimensions of the original image are shown. To avoid stretching of the image, make sure the lock icon is closed ( ). You can increase or decrease the height or the width of the image, the other value will follow. Click OK to insert the image in your creation. Put your mouse cursor where you want to insert the Flash animation. Browse to the animation you want to insert and click it. In the Width and the Height field, the dimensions of the original animation are shown. Click OK to insert the animation in your creation. Note: For reasons of deliverability and rendering, it is better not to include animations in e-mails. Use this feature only when you are creating landing pages. Put your mouse cursor where you want to insert the table. Define the number of columns and rows in the table. Define the width of the table. You can define an absolute width (pixels) or a relative width (percentage). Define the width of the border around the table (border width) and the width of the lines in the table (distance between cells). If you do not want to show borders, set both border values to 0. Define the alignment of the table (center, right, left) on the page. To give your text some space, define the distance of the text to the border. Click OK to insert the table in your creation. Note: You can still change table properties by right-clicking the table. To define the colour of the table border or the background colour of the table, select the table and right-click it. You find colour settings in the cells submenu. How do I copy text from Microsoft Word without impact on the design of my email?